In almost any town or city, bike shops are the hub of the bicycling community. They are the hub of the PeopleForBikes community, too. We have more than 1,000 retailer members spreading the word about PeopleForBikes, bringing new riders into the movement and collecting donations to help fund our Community Grants program. Each month we showcase one of our retailer members who is going above and beyond to help improve bicycling in their own community. Last month we turned our blog over to Martha Emmons at BikeWorld in Paducah, KY. This month, we spoke to our friends and recent retailer contest winners at Bikes & Moore in Hopkinsville, KY. For their fantastic efforts in recruiting more riders for PeopleForBikes, they won a $200 party and a symbolically adopted sea otter via the World Wildlife Fund, inspired by our trip to the Sea Otter Classic last April! Bikes & Moore’s Dustin Slow gave us some insight into biking in Hopkinsville and what they’re doing to help get more veterans on bicycles. 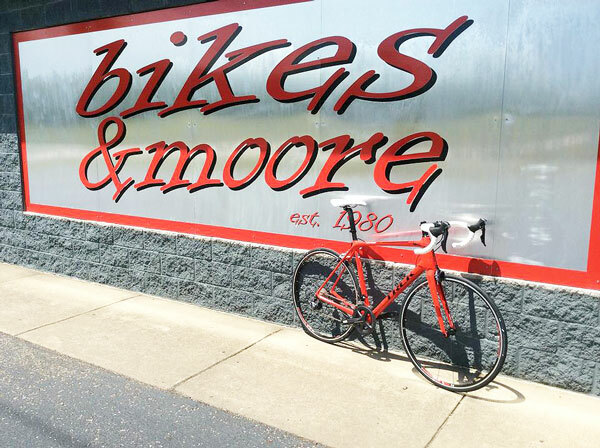 Bikes & Moore is a small business in Hopkinsville, KY. Tim Moore started the shop in 1980 and we’ve grown through three different locations over the course of 30 years. Six employees; five full time (Tim, Dave, Jason, Dustin and Amber) and one part time (Andrew) make up our staff. We primarily stock Trek and Specialized along with Diamondback and Mirra Co. On top of this, we are Body Geometry Fit experts and we fit our customers perfectly to their bikes. It also helps people who can’t ride because of injuries and other physical issues get back on a bike. 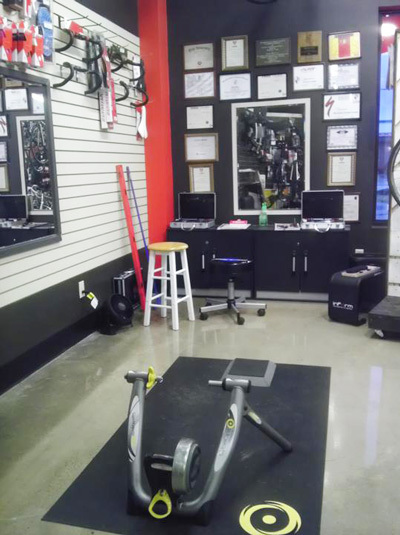 The fit studio at Bikes & Moore. What are some unique ways that Bikes & Moore has reached out to new PeopleForBikes supporters? We have a sign-up sheet at every register, along with buttons and stickers. Most of the employees wear a PeopleForBikes button. My personal bicycle has at least three PeopleForBikes stickers and I know that others in the shop have followed suit. We talk about the various donations and fundraisers held by PeopleForBikes and are always excited to be involved! How do you keep your employees and customers excited about PeopleForBikes? Every employee at Bikes & Moore is signed up for the PeopleForBikes newsletter. Being a Trek dealer certainly helps keep us hyped about PeopleForBikes and the different goals set forth by both organizations. We were also super excited when we found out we won the PeopleForBikes summer retailer contest! Ready to roll for the 2014 Specialzed Women’s Day ride! 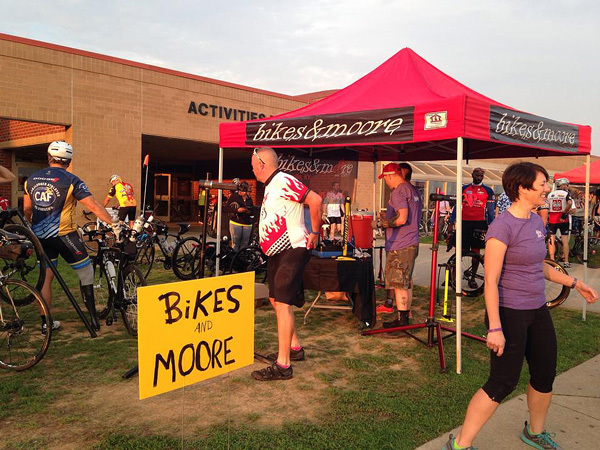 In what ways is Bikes & Moore involved with the Hopkinsville community? Having Ft. Campbell (an Army base) located near us is a huge part of Bikes & Moore’s business. We like to give back by donating our time to helping those with different wounded soldier programs (Wounded Warrior Project, Ride 2 Recovery, etc). These programs help wounded soldiers grow and develop through bicycles. The main group we work with is the WTB (Warrior Transition Battalion). In fact, they just did a ride last week from Ft. Knox to Ft. Campbell. That’s 170 miles in two days. They are some of the best people we have ever had the chance to ride with. It’s amazing to be riding with them, fixing their bikes and giving a little push every now and then if they need it. Do you have any big plans for your store for the rest of 2014 and into 2015? Well, we are currently working on a local cyclocross series. The first race was in early September and it definitely exceeded our expectations. Our local rail-trail, Hopkinsville Greenway System, is coming along very nicely as well. It just had its grand opening on September 27th. Honestly, our only real plan is to get more people on bikes. That, and get those who are already on bikes to ride more. The cycling community is steadily growing here in Hopkinsville, and we sure like to think we are the main cause for that. It’s a great feeling to know that doing what you love is improving the community in your own backyard. We know that part of the prize for this contest is a symbolically adopted sea otter, which we’re beyond excited about! We’ve decided to hold a naming contest for the little guy with the winner receiving an extra special invitation to the party we’ve won! It’ll definitely be one for the books. A big thanks again Dustin Slow and to the rest of the crew over at Bikes and Moore! You can find the PeopleForBikes retailers near you over at our Get Local map. If your local bike shop isn’t a member but should be, you can encourage them to sign up here.